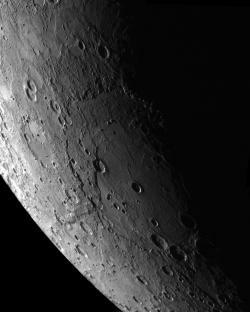 Of Interest: This mosaic was assembled using NAC images acquired as the MESSENGER spacecraft approached the planet during the mission's second Mercury flyby. The Rembrandt impact basin is seen at the center of the mosaic, as night was falling across the basin's eastern edge. An image similar to this one appears on the cover of the 1 May issue of Science magazine, which contains four articles on the latest results from that flyby. Click here to view more materials presented during a NASA media teleconference about these latest findings. Credit: Image produced by NASA/Johns Hopkins University Applied Physics Laboratory/Arizona State University/Carnegie Institution of Washington. Image reproduced courtesy of Science/AAAS.